My friend GTA’s name is not really GTA. Actually, GTA stands for Grand Theft Autumn, but that’s kind of a mouthful, so we don’t call her that. In case you haven’t figured out yet, GTA and I play roller derby together. I met her the week before tryouts a few years ago. A couple of us went to the local outdoor skating rink to get some last minute practice and she met up with us there. At the time I had no idea who she was, but as it turns out, GTA is a force in the derby community. At that practice she taught us how to do whips which we had never done before and it paid off tremendously as a few days later we were asked to do them during tryouts. Since then, we’ve been on the league together and since we conveniently live close to one another, we’ve spent a lot of time in the car together traveling to and from practices. And GTA’s teaching has extended beyond just the track. In those hours in the car I’ve learned more about Drake, Boo, Beyonce, and more internet memes and other viral social media than I could have ever could have imagined. When GTA asked me to make her cake, of course I said yes. One, this is the ONLY wedding we’ve been invited to so far this year (after seven weddings last year, this is a welcomed relief), and two, this is the only wedding cake I’ve been asked to make so far this year. Also, GTA and Adam are awesome. 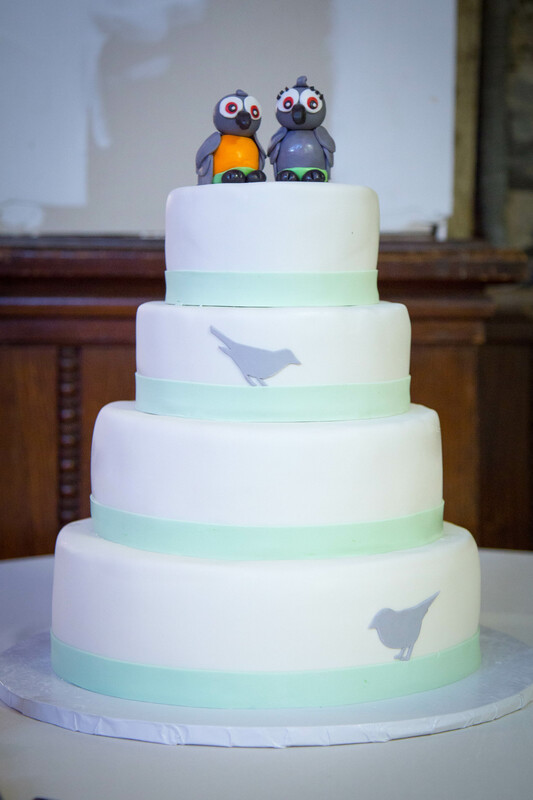 Knowing GTA, I half expected her to ask for a cake of a life-sized corgi or something but when she sent me pictures, the cake she wanted was a beautifully simple and understated design. The four tiered cake was three flavors: the bottom was funfetti (yes! happiest cake flavor ever! ), the second tier was cherry vanilla, and the top two were german chocolate cake. Her colors were gold, mint, mauve, and gray and she requested a bird theme. GTA and Adam have a rambunctious parrot named Mel. Mel is full of personality and definitely makes sure his presence is known. So, while actual Mel could not be at the wedding, we decided to bring a little bit of Mel to the wedding. Mel and Lady Mel were sculpted out of fondant and were perched (ha, see what I did there?) on top of the cake for a good view of the festivities. And oh, were there festivities. There’s no party like a derby party and with tiny foods (seriously, tiny hot dogs, tiny slides, tiny bowls of cheesy grits) and root beer float shooters, the food game was on point. We ate, we drank, we danced so much it required outfit changes. What a fun night. Congrats GTA and Adam! Everyone loved the cake! We have yet to show Mel his fondant likeness but when we do, I will be sure to record the results. Thank you so much.